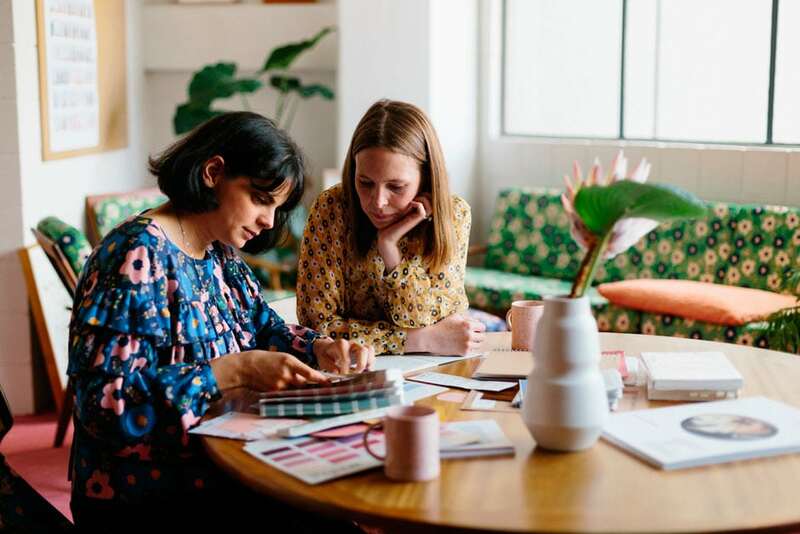 Anything’s possible for fashion designers Rachel Easting and Anjali Burnett, whose fresh new fit-out is a space to thrive in. So, guys, where in Wellington is the Twenty-Seven Names studio? Anjali: We’re in Te Aro, in the central city. The surrounding streets have great restaurants and cafés, and a wonderful mix of businesses. On our doorstep is the best little coffee shop in town — shout out to Milk Crate, their salads give me life. 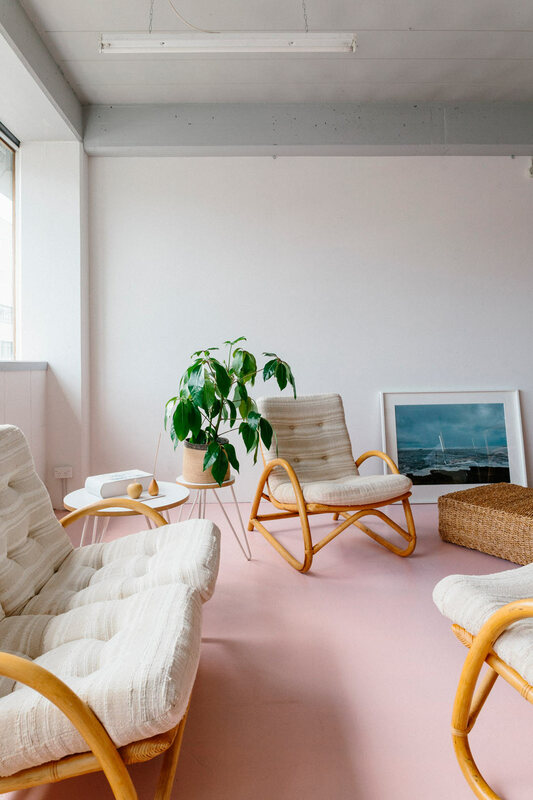 Precinct 35 has a beautiful collection of homeware, some of which is scattered around our studio, and Coffee Supreme has treat day on lock — mmm, doughnuts. Is this where the brand began? Rachel: In our first few years of business, we moved around quite a lot as we were constantly outgrowing where we were or realising we needed something different. We’ve been here for seven years now, and three years ago we expanded into a second office on our floor. Now we have a larger workroom, and a separate office/photographic studio where Anjali and I work. Five lovely women work with us, though not all of them are full-time, so there’s a different mix of people here each day. ABOVE Garments from Twenty-Seven Names’ new collection, A Cat May Look at a Queen, which celebrates taking chances and having confidence in your own ideas. You’ve recently given the place a refresh — what were you hoping to achieve? A: We wanted to make it as enjoyable to be in as possible, and most of all practical. Our previous set-up had everything we needed but the spaces weren’t user-friendly, and we were cramped in some areas but swimming in space in others. 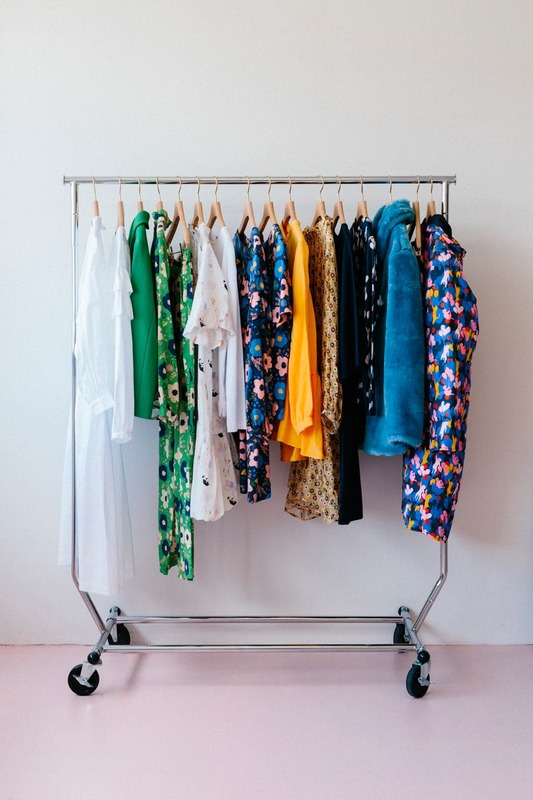 Moving our team into the main workroom has given them the space they need to create and focus, and puts them where the action is in terms of sampling and the creation of collections. There’s enough room there to house all of our dispatch too, so it feels so much more streamlined. In our smaller office/studio, we’ve removed a large internal room that was previously used for storage. It’d been taking up most of the space and created awkward and dark areas. Now we’ve opened it up, there’s enough room for Rachel and I to have our desks and design table and shoot our lookbooks. That photographic space is worth its weight in gold when you can just wheel the racks in from next door and shoot. It’s such a dream to have. ABOVE The team beavers away on Arnold Circus stools by Martino Gamper, also from Precinct 35. “Getting to design a new collection each season and try to better the last is hugely satisfying,” says Rachel. What inspired the aesthetic? 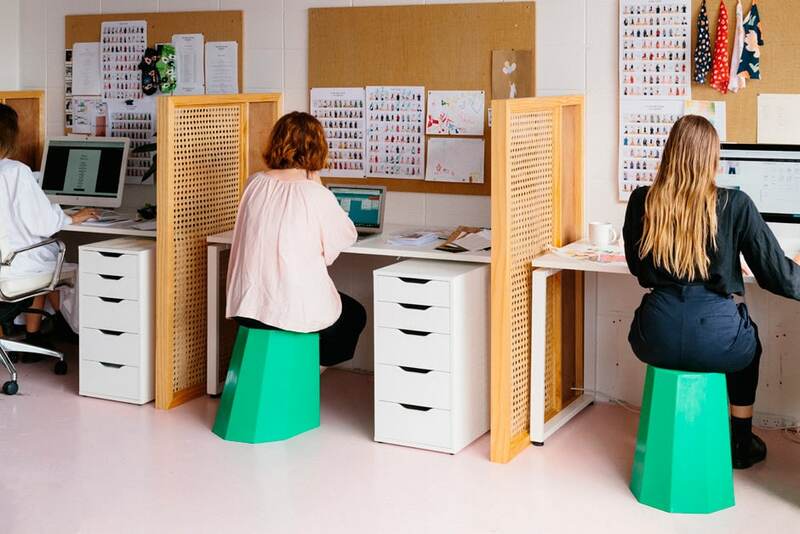 A: We have a really hard-working team, so we wanted it to support their creativity and productivity, and it’s also a female space, so we wanted to celebrate that. One of the main things we wanted to change was the flooring, and we’ve always loved pink, so we chose to paint the concrete in the workroom in Resene Paper Doll. 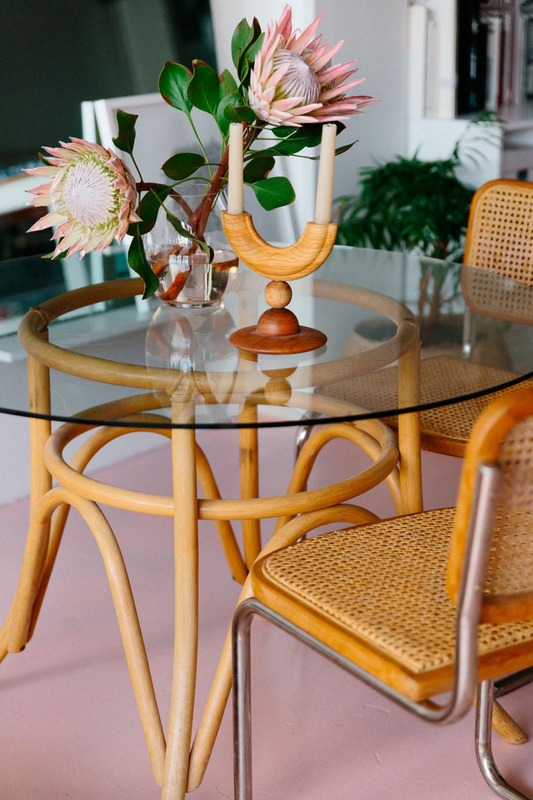 We had some leftover rattan from our Newmarket store fit-out, which we thought would be amazing to use as screens to separate the workstations in this room, and the pale timber of these dividers then inspired us to find the thrift-store cane table and lounge suite. For our office/studio, we decided on a watermelon carpet. In contrast to the workroom, the darker shade makes it cosier and creates more of a homely vibe. 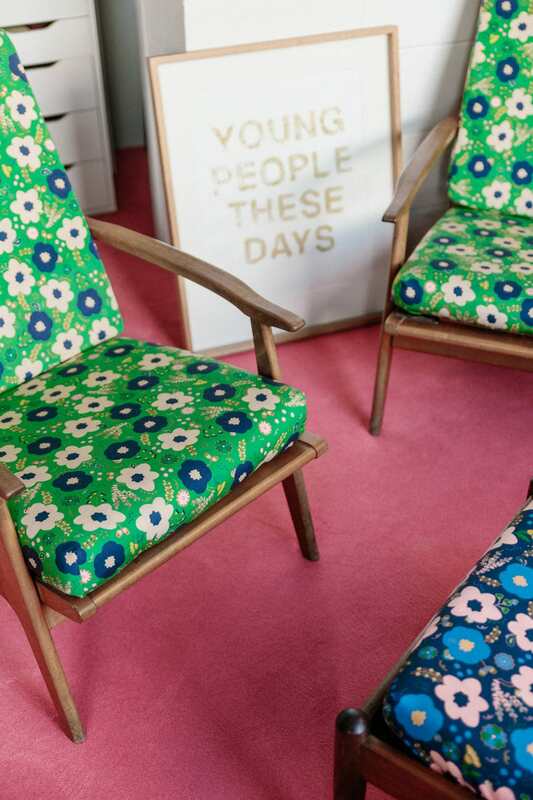 This room features a Don lounge suite, which we re-covered in a green and pink print that features in our upcoming Autumn/Winter 2019 collection, A Cat May Look at a Queen; a mid-century table and chairs; and a vintage Danske Møbler sideboard that we keep our design work in. ABOVE The carpet in the office/studio was ordered through Flooring Xtra. Milled in France, it had to be specially made, as the colour wasn’t stocked in New Zealand. The fabric used to re-cover the lounge suite found at Mary Potter Hospice was designed in-house by graphic and textile designer Sally Shand. Did you design the fit-out and source the items yourselves? A: Yes, plus we had a coffee with our architect friend Mary Daish, whose office is on the top floor of our building, and threw around some ideas with her. Her brainwave was suggesting that we remove that large storage room and build some smaller units to house the things that had been in there. Once the layout was decided, it was really just Rachel and I choosing the most essential things that were needed to transform the rooms. My husband Drew built the storage cupboards and rattan screens, which I think make our space really special. R: Anjali is the queen of the thrift-store shopping experience, so a lot of the pieces included here are vintage and secondhand. Whenever she suggests we look at the City Mission, Salvation Army or Mary Potter Hospice stores, I complain that we won’t find anything, but we always come away with the best things! Does interior design influence your fashion collections? R: I think all areas of art and design bleed into one another. We’ve always looked to contemporary, modern and other 20th-century art for places to start our collections. Our lookbook sets are little interiors in a way, so we’re lucky that we get to play with new ideas each season. Anjali photographed a beautiful little still life to accompany our lookbook shots for A Cat May Look at a Queen, and we made covers for a mid-century stool in our signature prints to accompany the scene. Is there such a thing as a regular day in this office? R: We do such a variety of tasks daily, and are so lucky that the seasons are an ever-changing cycle. I think the best times of the year are the really creative ones. Anjali and I set up big boards to map out the fabrics and designs we’re thinking of, and these days are often followed by days in the workroom patternmaking and cutting/sewing up toiles. This process is several months long, and blends into the next almost immediately after each collection is finished. What are the most rewarding aspects of running your own business? R: We get to work together every day and have built a livelihood that not only supports ourselves and our families, but also those of our team. It’s amazing what two 22-year-old women can do when they decide to start a business straight after studying. I’m grateful that so many years of really hard work are behind us now, and that we’re able to set our sights higher each season. ABOVE Rachel and Anjali bought the workroom’s cane lounge suite from local store Add & Vintage, and the glass-topped cane table was a fantastic find at the Salvation Army store around the corner. The timber candleholder is by Walk in the Park from nearby favourite Precinct 35. What are some of the lessons you’ve learned that you’d pass on to aspiring creatives? A: It’s about staying power. I think if you’re focused, determined and willing to sacrifice some aspects of your life, there’s nothing you can’t just work really hard at. Our partnership is one of the best things about our business as there’s someone with you the whole way, and we can share the ups and the downs. What’s coming up on the Twenty-Seven Names calendar? R: We’re moving our beloved Wellington flagship to 25 Ghuznee Street, a block down from our previous space, and planning to open in early February. As we did with our Newmarket store, we’re working with Rufus Knight at Knight Associates on the fit-out, and have such special plans underway, I can’t wait to get in there. The post You name it appeared first on homestyle.